Metro’s in a bad way. They’re facing a $189M budget deficit for the fiscal year starting in June, and proposed service cuts are pretty draconian. 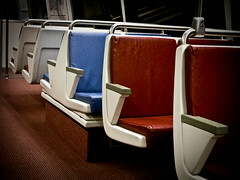 There will be a series of six hearings related to the deficit, and Metro will seek public opinion for how to address the major gap in funding and the service level of the transit system at large. Some of the options for the service reductions are pretty draconian, and include the removal of 8-car trains from service, and closing three stations on the weekends, as well as reducing the frequency of approximately 40 bus lines. The options right now would make an already crowded-to-capacity system practically unusable. If these aren’t the sort of thing that you’re comfortable with, maybe a fare hike is more what you’re looking for. Options there include increasing the peak charge from $1.65 to $2 each way, and the maximum to $5.45, and peak-of-the-peak charges of $.50, as well as $.35 hikes in bus fare, and peak-of-the-peak charging for Metrobus, as well. No matter what you do, you should check out Fair Share for Metro and use their tools to contact your representative to let them know how important Transit issues are to you. Click through for the locations of each hearing, they all begin at 7pm. Heck of a job, Catoe… heck of a job. Do they really? Or are we going to have them listen to us followed by them doing whatever they want?